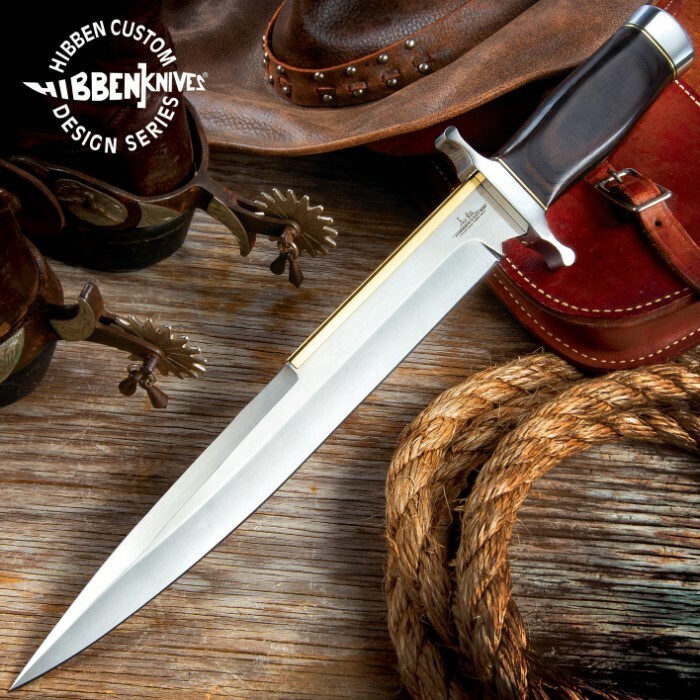 Gil Hibben Old West Toothpick Bowie Knife and Leather Sheath | BUDK.com - Knives & Swords At The Lowest Prices! Gil Hibben has a history of designing knives for Sylvester Stallone to feature in his films, going back to the "Rambo III" Bowie. Stallone is an avid collector of Gil's custom knives, and that relationship continued when Stallone commissioned Gil to make several knives to use in his new film, "The Expendables." One of these movie star knives was a never-before-produced, custom designed Old West Toothpick. 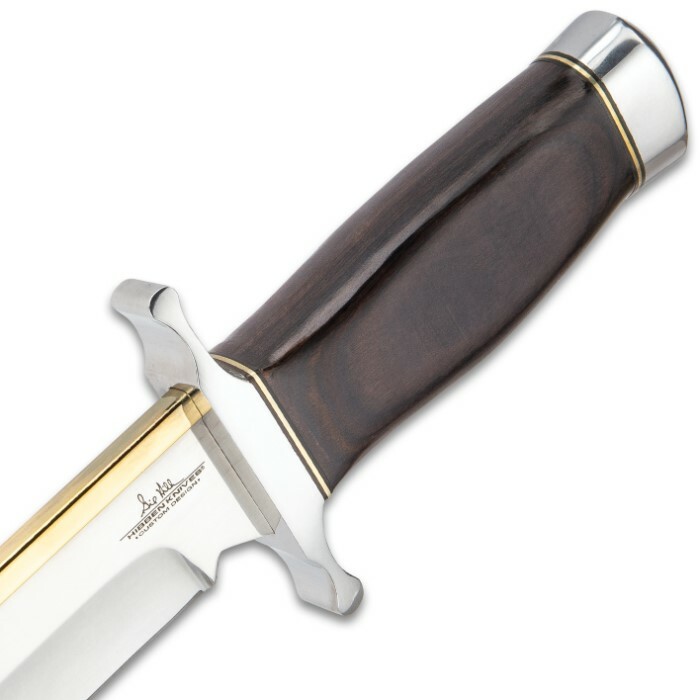 This handsome, versatile fixed blade knife features a classic 11 7/8" Arkansas toothpick style blade, gold plated blade back and classic hardwood handle. It includes a handsome genuine leather sheath and certificate of authenticity. Measures 17 1/2". I started collecting knives about a year ago after I started collecting Katanas about two years ago. Basically I wanted to try to get at least one of every different basic kind of knife. I bought a bowie, a kukri, a dagger, a small folder and now this. I was looking for something with this design but when I got it in the mail, I was amazed. The fit and finish is absolutely out of this world. Perfect. And, it was razor sharp out of the box. I was only surprised by the fact that it was larger than I envisioned and, or course, a little heavier but this blade is absolutely gorgeous and highly recommended. 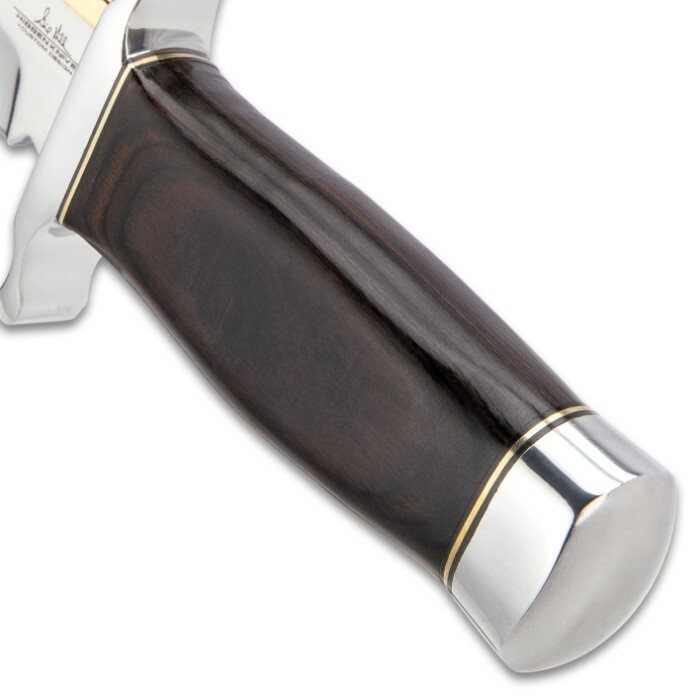 The mirror finish is simply beautiful. I almost hate to cut anything with it but paper to remind me just how sharp it is. Awesome knife! I'm a knife collector, so when I saw that the " Expendables" bowie knife was on sale for 50 bucks I decided to buy it. Man o man! This thing is not only a collectible, but a real fighter as well. It is RAZOR sharp, and I could not find a single flaw in it. It is well built and the mirror polish is superb. 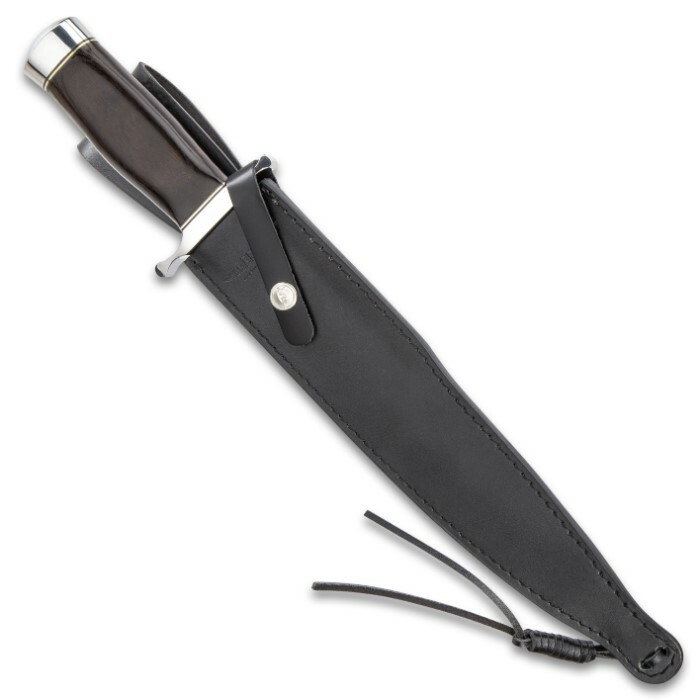 The sheath is made of real leather and is built and designed well. The knife fits perfectly in the sheath and I have no problem sheathing and unsheathing it. Again it is RAZOR SHARP, and I would recommend it to anyone. 10/10. Ps: Budk has great customer service, the best prices, and shipping is great . This is probably the best knife so far I have bought from BUDK! The knife is beautiful and solid build. 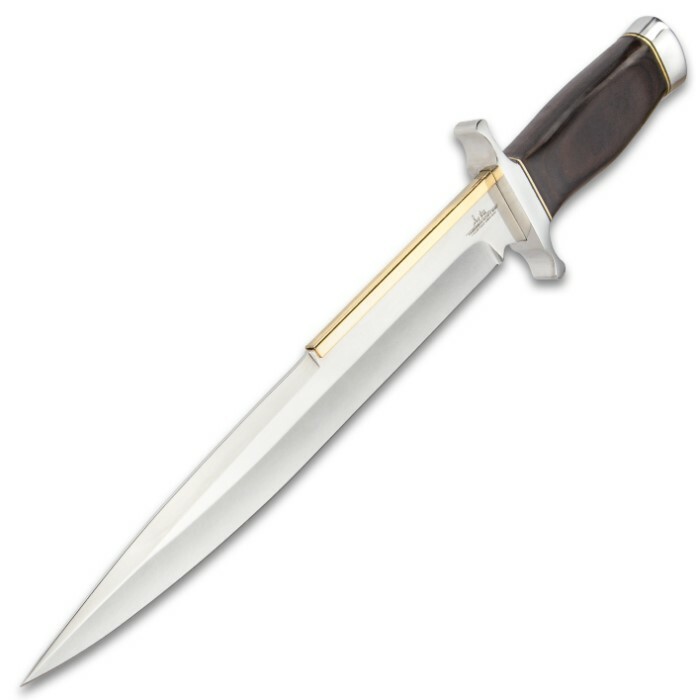 This knife is great for collection or you can use it for protection. The knife is sharp out of the box. BUDK have the best price in town! I really like this knife. Big, hefty, beautiful and sharp right out the box. Definitely an intimidating piece. And for $50 you can’t go wrong. This is my 2nd one. Kudos to Budk for fast processing/shipping. Such a nice knife! Long and heavy blade, which came shaving sharp right out of the box. I cut my finger down to the bone running my finger lightly down the edge, doubting it’s sharpness, so be careful. The brass spine looks quite nice. The leather sheath is well-made, but fits a little too tightly. I’m sure that this will resolve itself over time, though. My only complaint worth mentioning is that (even with my above average-sized hands) the grip feels like grabbing a 2x4. It is not the end of the world, since I can always sand it down to a more comfortable shape and re-finish it, but it is worth noting for anybody with small to medium hands. Overall, I am still extremely happy with my purchase, and it will adorn my hip for the foreseeable future. This is another one of Gil's blades for my collection. Beautiful construction massive and so sharp it can cut paper like a safety blade. Nice sheath , too nice of a knife to take on a camping trip...but would hold up nicely as it's a beast. The handle perfectly carved and fits well even in my average hands. Great value and identical to the expendable version minus the logo. I purchased this more out of curiosity than anything else, and I can say I'm quite happy with this knife. I cannot say how strong the tang is because I haven't attempted to see how it's fastened in the handle or how far in it goes, but as a cutting and stabbing tool this thing would be devastating. I'm usually more about function than fashion but this one wooed me. I have to admit that I like showing it off.